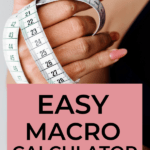 Here is an easy macro calculator that you can use as a guide to know what macros you should be eating when you're starting a keto diet. Just a note about this calculator… it works best on Desktop. We're currently having issues on mobile and are looking into this. Thanks so much for your patience.